I tell you three times: camera phones are the most significant driver of social change since the early 1960s, when television brought the street battles over civil rights into nearly every American home. We are only just beginning to appreciate the myriad ways in which the constant presence of camera phones is changing our society, but one thing at least in certain: it is harder to get away with things these days. A case unfolding in Vancouver, Washington, offers a perfect illustration. A little over a week ago, on June 15, a 14-year-old female student at the Evergreen High School in Vancouver told the school resource officer that her teacher (later identified as Matthew Morasch) had allegedly been using his phone’s camera to either photograph or record video of her under a classroom table. She reportedly learned about it when one of her classmates showed her a photo she had taken of Morasch holding his camera under the table while talking to her and two other students. Other students told police that they observed Morasch holding his phone under the table, and one said that he could see that the phone was in recording mode. School administrators and the student resource officer met with Morasch during the next class period and immediately placed him on administrative leave. The incident was reported to the Vancouver Police Department, who interviewed Morasch and asked him to surrender his phone, which he did. In the meantime, photos of Morasch holding the phone under the table were already making the rounds of social media. 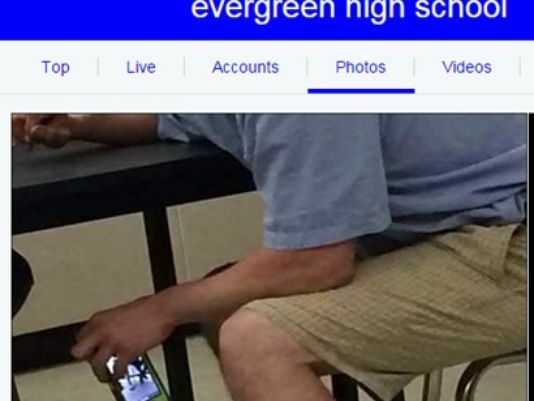 In a version that appeared on Facebook, the awkward position of the teacher is clearly visible, as are the faces of the students that he apparently is trying to photograph or record. The privacy rights of the students recognizable in the photo. Whether students unintentionally interfered with the subsequent investigation by alerting Morasch to the fact that he had been observed and photographed. The rush to judgment about what Morasch was doing [yes, it is difficult to think of an innocent explanation, but he’s entitled to the opportunity to provide one]. The impact on Morasch’s ability to get a fair trial, giving the publicity surrounding the case in general and the photo in particular. There are no easy resolutions to these issues, particularly given the fact that governmental authorities routinely release potentially prejudicial information during the course of the investigation. In this case, for instance, the Vancouver Police Department announced that an inspection of Morasch’s phone revealed two voyeuristic images: a photo shot in Evergreen High School on April 27, recording a female student in a dress while she sat on a desk opposite Morasch’s desk, and a video shot the same day in a local Goodwill store, recording up a woman’s skirt as she looks at a bookshelf. Whatever images Morasch created on June 15 apparently had been deleted from the phone; there is no indication yet whether mobile forensics has been or will be successful in recovering the material. On Monday, June 23, Morasch appeared in court and was charged with two counts of video voyeurism. The judge ordered that he be held on $5,000 bail. Morasch posted bail later that day and will be arraigned on July 7.